Hello, everyone! 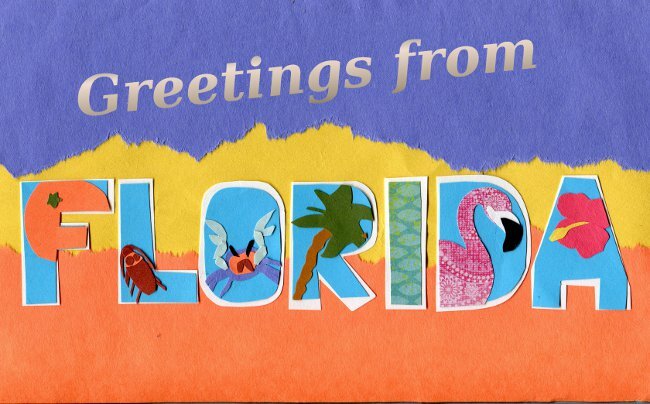 I am visiting my family in Florida, so I’m taking a short break from all the cutting and pasting. I’ll be back in a couple of weeks, though… probably with lots of newly remembered childhood stories. Hope you’re all having a fun Spring Break! If you’re not on Spring Break, I hope you’re having a fun little Spring Break in your heart. By the way, I’m participating in Munch Madness over at Knuckle Salad, so if you love snacks and filling out brackets, you might want to check it out! Have a very delightful and adventurous Spring Break with your family!! Typically at this time of the year, I would be ‘jealous’, but we’ve had such a splendid winter, here in wisconsin, (WAAAAY above average!) that all I have to say is, “Whatch out for the gators baby!” ENJOY :) ! OMG! Land of the giants! My mom lives in florida ( just south of orland ) I don’t recall EVER seeing one that big, wow! I do say though, those giant beetles have caught me off guard a time or two! Your little girl is sweet :) Have a good visit! Thanks for the pics! lol! or you might need therapy! then again I’ve heard plenty things about dipping in chocolate ;) Course they’d have to charge a bit more for the gourmet big daddy version! yum-yum??! 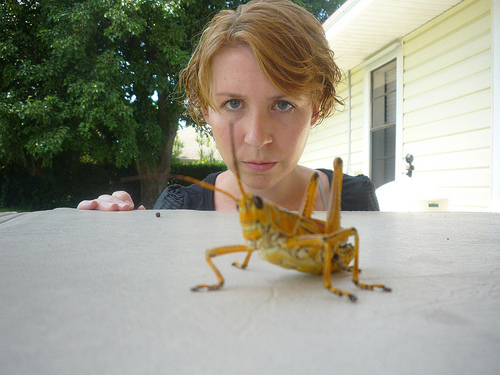 I got in so much trouble from everyone over that dang locust, everyone was so suddenly protective over it…I blame your picture. Happy vacation middlest sister. We’re gonna be missing you till you’re back! Your adorable daughter looks as if she’ll be providing a new round of fun cartoons for the future! Cannot deal with bugs of that size. Ew. Finding it humorours that even your “Taking a break from cutting and pasting” involves “cutting and pasting” ! Have a great time! I was gonna say the same thing about the cutting and pasting thing, haha. You never fail us, Nikki. Just occurred to me. You should make a middlest sister font. Enjoy your vacation! I hope that you have a splendid time!!! Thank you for including the palmetto bug. I feel the same tender way about that roach. I also wanted to compliment the palmetto bug. Nothing says Real Florida like those fuckers (although, growing up, they were just “roaches” until I learned that the rest of the country referred to roaches as something much less terrifying). Awww, have a wonderful time! Have a wonderful time with your family! I’m enjoying my spring break, too. My daughter is home from college this week and we’re having a splendid time! Have a fantastic time! BTW – the bugs in Louisiana are just as bad – if not worse. That’s why I don’t live there anymore! Aw, I miss you already! Happy Florida! Love the postcard. I’m eagerly awaiting her return! It appears to me that this site doesnt download in a Motorola Droid. Are other people getting the same problem? I enjoy this webpage and dont want to have to skip it whenever Im away from my computer.